Following years of robust community engagement and stakeholder input, the conceptual Willamette Falls riverwalk design was unveiled last year. The design team, Snøhetta, Mayer/Reed and DIALOG, worked collaboratively to complete the concept for the riverwalk that will connect Oregonians and visitors from afar to Willamette Falls in a way that hasn’t occurred since industrialization began generations ago. This design will carry through all phases of the riverwalk. 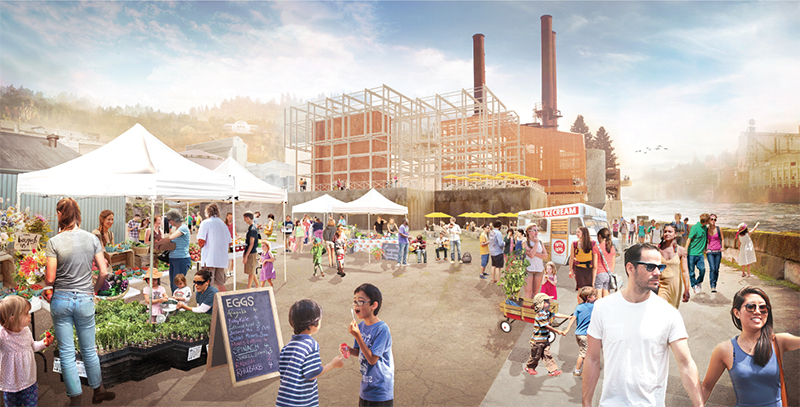 Willamette Falls Legacy Project staff submitted riverwalk permit applications to the Army Corps of Engineers, Department of State Lands and National Marine Fisheries Services in May and estimate breaking ground on the first phase of the riverwalk in the spring of 2020. The RFP will be posted on the Oregon Procurement Information Network (ORPIN) this fall. You can check here for updates. If you are interested in learning more, please contact the Willamette Falls Legacy Project at [email protected].